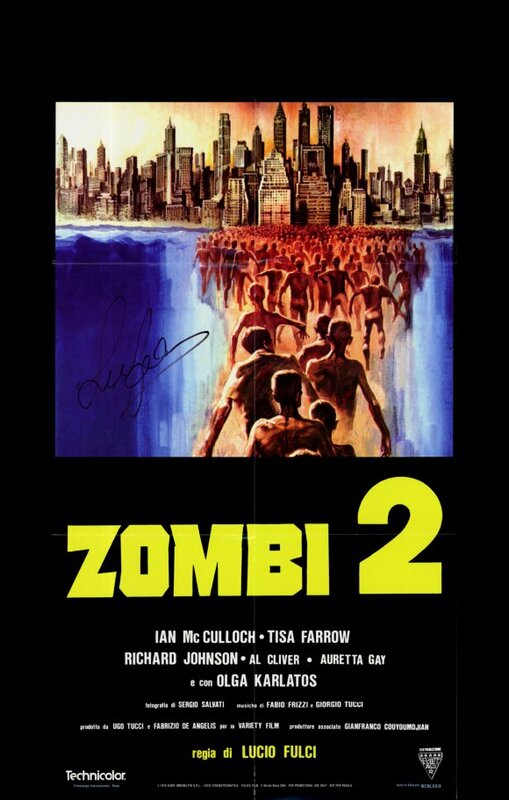 Digi-Schlock: ZOMBIE (Blue Underground 2-DVD Set) – Schlockmania! Some titles are destined to be visited again and again by DVD companies. It can be done for any number of reasons – new technology, an anniversary, etc – and if a fan is lucky, the presentation the film will evolve with each release. 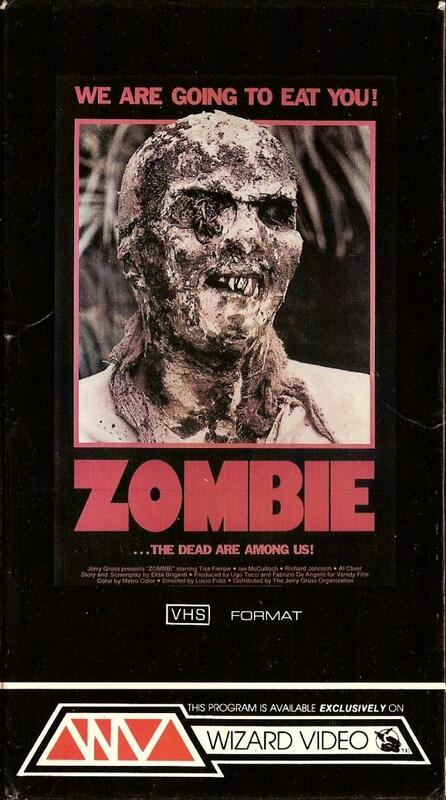 Take Lucio Fulci’s Zombie, for instance: the Anchor Bay DVD beat the old VHS versions with its letterboxed transfer – but said transfer was also pale and primitive-looking by modern standards. A few years later, Shriek Show and Blue Underground simultaneously release new discs of this title with the same transfer (find out why by clicking here). The Shriek Show had scads of extras but botched the transfer through an interlaced presentation. The Blue Underground disc looked great but was comparatively light on extras. Luckily for fans, Blue Underground has returned to the well for a 40th Anniversary presentation… and the results offer a step up in all departments. The transfer utilizes a new 2K transfer that was supervised by cinematographer Sergio Salvati. The results look great, even through the standard-definition prism of a DVD: the black levels are nice and rich, the color palette of the island photography is suitably lush and the detail is nice and crisp. Viewers also get the option of watching the film with a short but enthusiastic intro from director Guillermo Del Toro (more on him later). In terms of audio, fans are treated to three choices: mono, 5.1 Dolby Stereo and 7.1 DTS. The 5.1 mix was used for this review: it doles out surround effects subtly but effectively. As you might expect, the throbbing electro/tribal score gets plenty of heft in this mix. There are also tons of extras for this redux, most of them new. The first disc’s main extra is a commentary track that features actor Ian McCulloch and moderator Jason Slater. This track previously appeared on the Anchor Bay disc and has its problems but still manages to entertain. Slater’s moderating is tentative at best – he doesn’t have interesting questions or much chemistry with McCulloch – but McCulloch picks up the slack nicely. This genre-flick vet does a fine job of giving the fan an actor’s-eye view of working on the film, complete with funny stories about working without permits in New York and a run-in with a Sicilian crew member that resulted in a death threat. It’s a modest affair but fans will be happy it was preserved for the handful of killer anecdotes it offers. The rest of extras on disc one fall into two categories: trailers and images. You get both international and American spots, the latter being a nice hard-sell that sells the film as a gross-out (complete with barf-bag offer). There are also radio spots that offer an array of comic-book macabre scenarios to sell the film. The image gallery is the animated kind, set to cues from the film’s distinctive score. It’s pretty impressive as it breezes through all manner of posters, video boxes, stills and candid photos at a nice clip… much more involving than the usual click-thru gallery. Zombie Wasteland: this cast-driven piece captures four castmembers – Ian McCulloch, Richard Johnson, Al Cliver and stuntman/poster zombie Ottaviano Dell’Acqua – who are all interviewed during a group appearance at the Cinema Wasteland convention in Ohio. All are forthcoming with their memories of their work on the film, their opinions of Fulci and their gratitude for the third act of the career that they are now experiencing at conventions. The editing is punchy, the photography is great and the enthusiasm of the subjects is contagious (Cliver’s humility towards the film’s fans is downright touching). There’s also a fun coda that “quotes” Zombie itself. 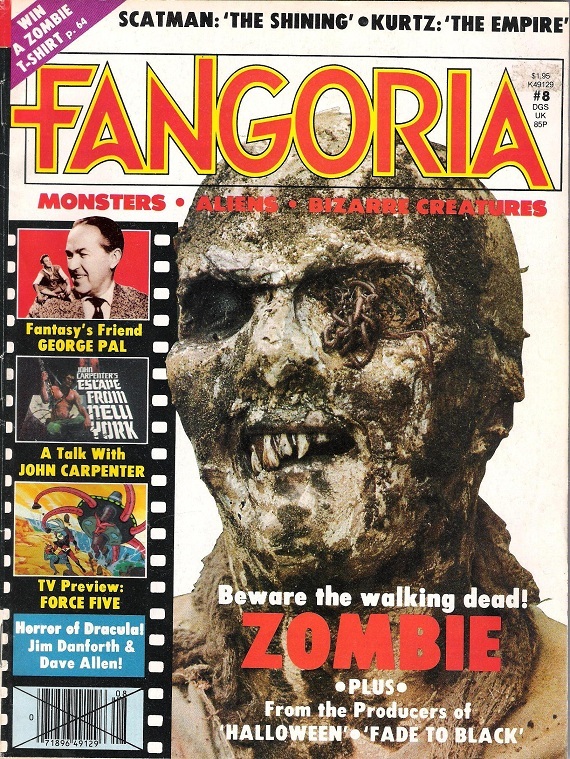 Flesh Eaters On Film: this segment is devoted exclusively to producer Fabrizio De Angelis, who reflects on how he formed a partnership with Fulci for several pictures (a rarity in the Italian film world). He talks a bit about how his horror productions were structured to “get” the audience and offers some interesting commentary on how international financing worked for films during his era. Deadtime Stories: writers Elisa Briganti and Dardano Sacchetti are interviewed about the script. Sacchetti takes the lead as he discusses how the screenwriting business worked in Italy in that era, how his habit of blending genres led to the film’s horror/adventure combo and the European comic book that indirectly inspired the premise. Briganti adds fascinating counterpoint material, including the tragedy that Sacchetti was coping with during the writing process, and also offers her own intriguingly philosophical thoughts on what made the film was so successful. World Of The Dead: this segment focuses on the look of the film and divides itself between cinematographer Sergio Salvati and art director Walter Patriarca. 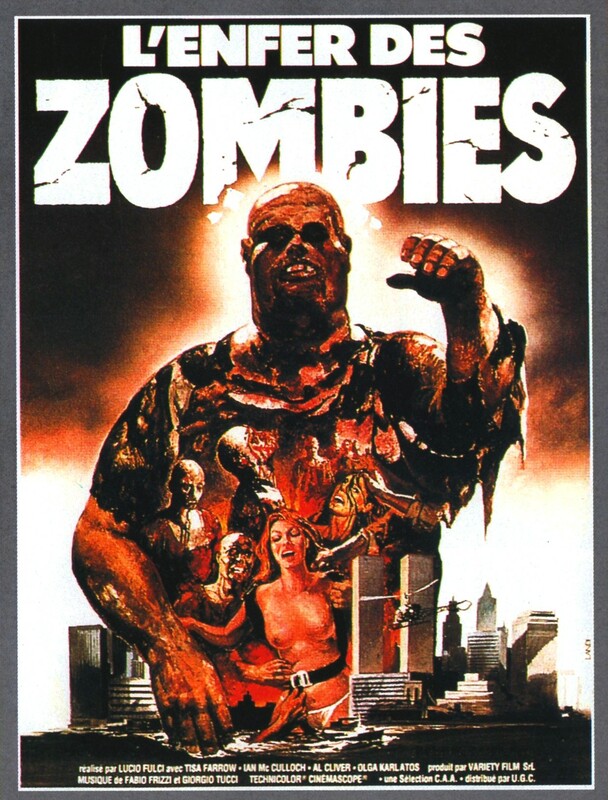 Salvati discusses how he and his crew pulled off atmospheric photography in a pre-CGI era, including lighting tricks used to make the zombies appropriately ugly. He also tells some great stories about how certain shots in New York were stolen, including the bridge coda (of course) all the aerial photography. Patriarca shows some cool production design art and tells an intriguing anecdote about the tortured genesis of the “hospital” set that he constructed on the island location. 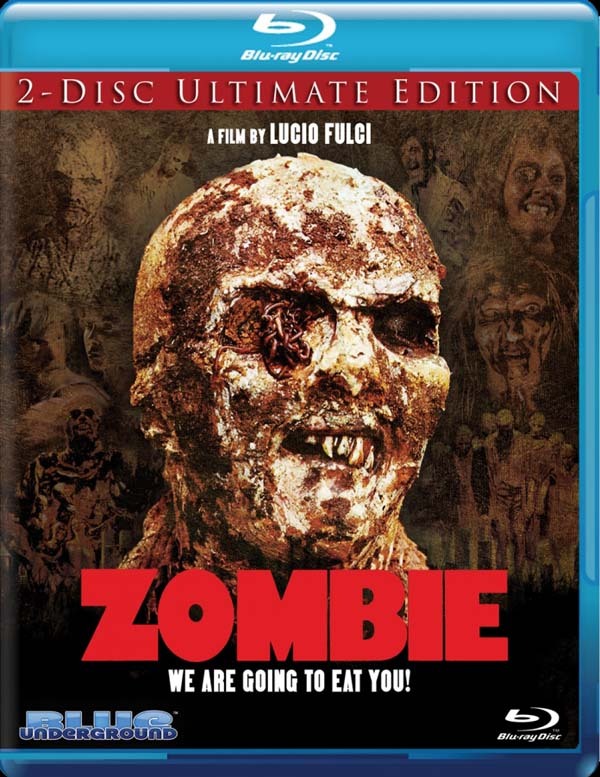 Zombi Italiano: Probably the segment the horror fanatics will like the best as it interviews makeup FX artists Gianetto De Rossi, Maurizio Trani and Gino De Rossi. 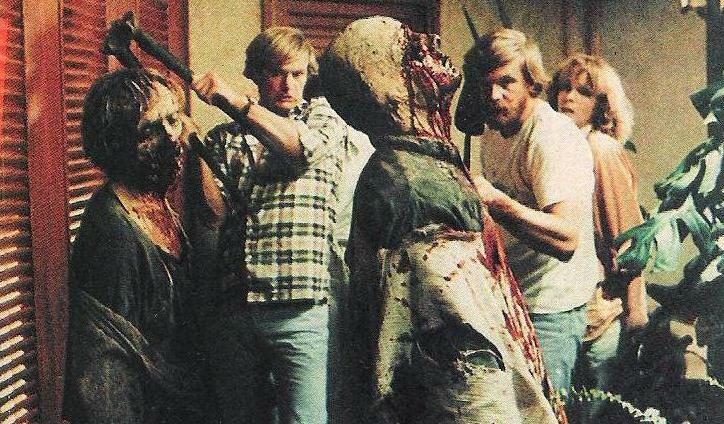 Plenty of interesting insights into how key setpieces were pulled off, including a funny tale about how necessity was the mother of invention during film’s famous splinter-through-eye sequence and a gripping account of the film’s famous “zombie vs. shark” scene. A nice surprise here is Trani’s fond discussion of how Fulci was a mentor to him. Notes On A Headstone: this features composer Fabio Frizzi discussing his famous score. 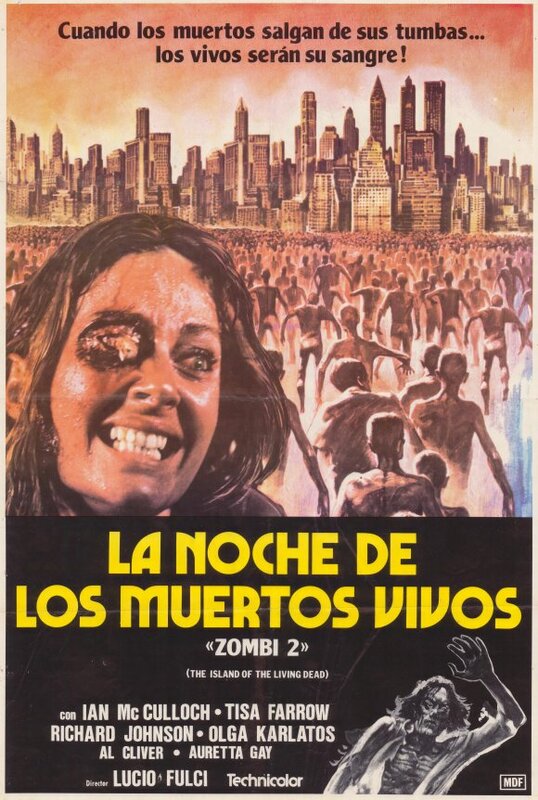 It’s brief but action-packed as Frizzi blitzes his memories of working with Fulci, his take on different scenes and how choosing where music wasn’t used was often as important as how it was used. He’s a charming, enthusiastic subject and the only regret here is that he didn’t get to talk more about the individual cues, especially the classic main theme. All In The Family: another brief piece that is essentially a brief collection of musings from Fulci’s daughter, Antonella, about her father. She offers a very personal take on his relationship with the horror genre and his attitude towards the filmmaking business. She also offers her own thoughts on why his horror work was so successful. Short but compelling and thoughtful. Zombie Lover: the last in line is the most pleasant surprise of the bunch. This is simply a piece in which director and Zombie super-fan Guillermo Del Toro discusses his history with and appreciation for the film: the movie palace he saw it in, the dreamlike quality of watching it and how hard it was to explain the film to disbelieving friends and family. He moves on to an appreciation of the film from a director’s standpoint that is full of fascinating details. The finished piece will charm the inner “monster kid” in every Zombie fan. All in all, the new featurettes are a vital addition to the lore of Zombie. Felsher and Kunz have delivered a lot of insight for fans in a series of entertaining, concise packages. Congratulations are also in order Paolo Zelati, the producer of the interviews, for getting the most out of this impressive collection of Italian genre film veterans. In short, the combination of a quality transfer upgrade and the expansive set of new extras make this a keeper for Zombie fans. Until the next evolution of this catalog favorite arrives, the Fulci faithful will be very pleased with this anniversary set. Great review! Now I will have to buy on of those blu-ray players… crap!